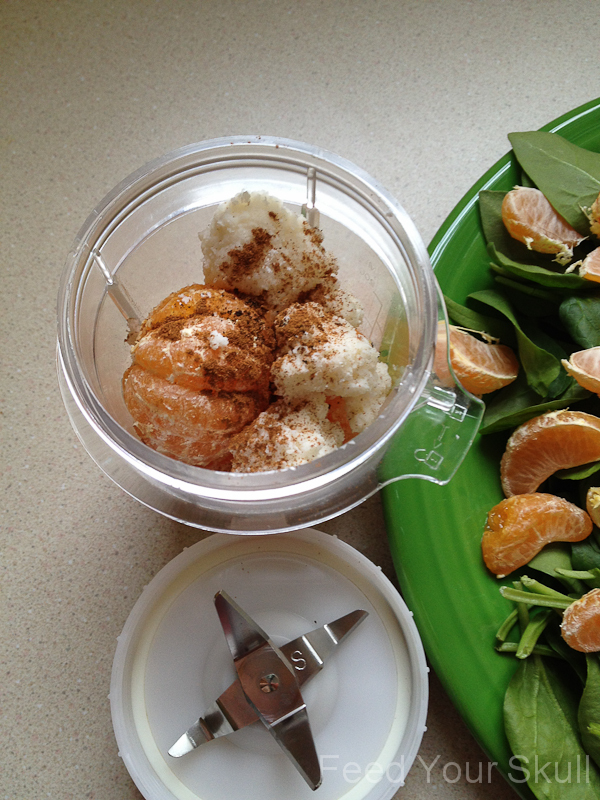 It’s time for another green smoothie deconstructed breakfast! 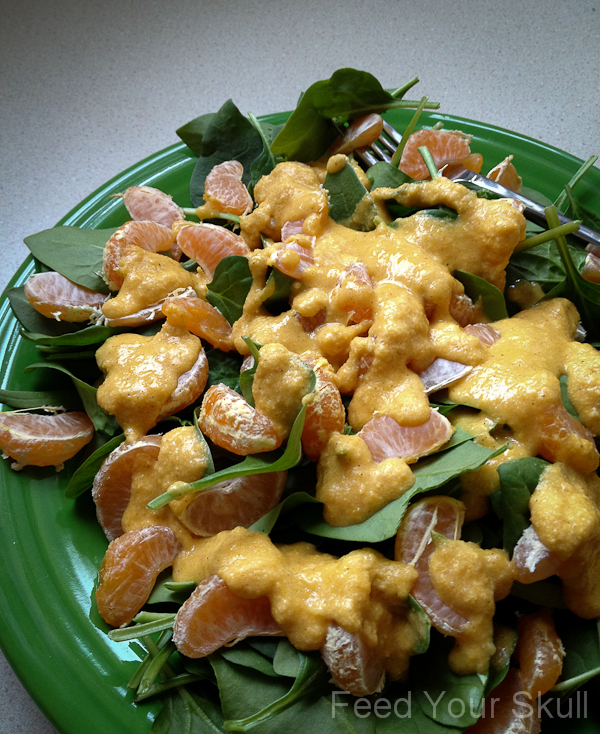 This morning it takes the form of a clementine breakfast salad. 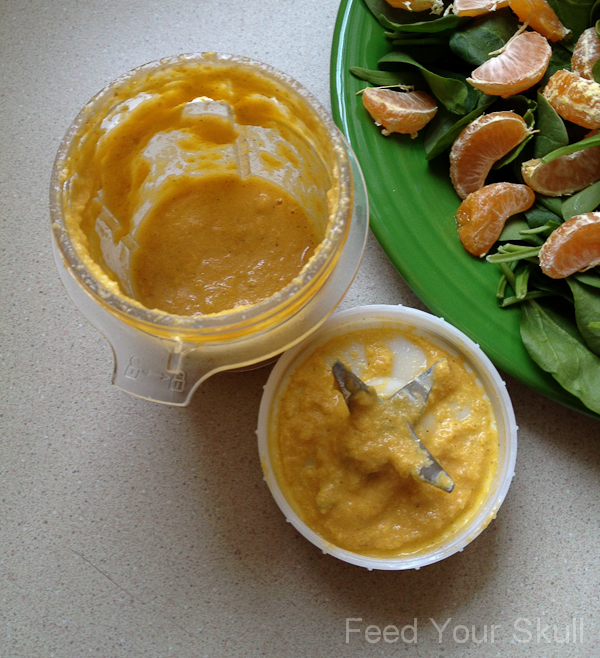 Using clementines on the salad as well as in the dressing provides a nutritious and vibrant start to your day. It’s simple to put together, travels easily and will be sure to provoke comments if you enjoy it at work. 😉 I personally loved those comments and questions turned conversations whenever I brought something interesting into work. A friend reminded me on facebook yesterday, as he was advocating green smoothies to a naysayer, great digestion begins in your mouth. Whether you’re chewing or drinking, you should be moving that jaw in a ‘chewing’ fashion, which stimulates the salivary glands. Digestion begins in the mouth, well before food reaches the stomach. When we see, smell, taste, or even imagine a tasty meal, our salivary glands, which are located under the tongue and near the lower jaw, begin producing saliva. This flow of saliva is set in motion by a brain reflex that’s triggered when we sense food or think about eating. In response to this sensory stimulation, the brain sends impulses through the nerves that control the salivary glands, telling them to prepare for a meal. Whether you’re chewing a smoothie or a plate of food, do it well and it will help you absorb more nutrients better, avoid gas problems and even help you realize and acknowledge that full feeling. 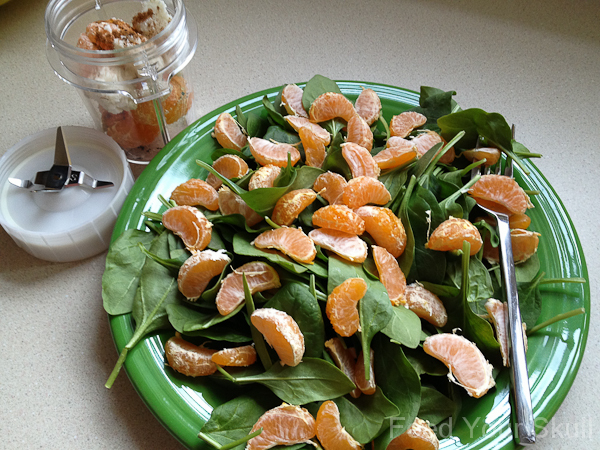 So, enjoy crunching on greens for your next breakfast and let this inspire an assortment of yummy breakfast salads. 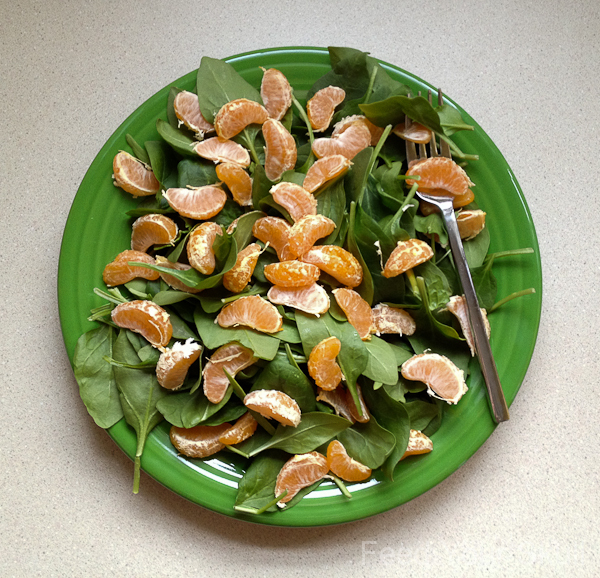 Arrange spinach and 5 clementines on a plate. Blend remaining 3 clementines, coconut butter, vanilla, salt, and cinnamon in a small blender cup and drizzle over salad.